Photo Associated Press: Nick Fradiani performs after he is announced as the winner at the American Idol XIV finale at the Dolby Theatre on Wednesday, May 13, 2015, in Los Angeles. After months of competitive singing, 29-year-old Nick Fradiani became the latest, and oldest, American Idol. In a finale broadcast live from the Nokia Theater in downtown Los Angeles, Ryan Seacrest crowned Fradiani, to the roar of the crowd. On a star-studded night of entertainment, most of which came off quite well, the show does what it does best. It celebrates the newest Idol and celebrates itself. It was announced last week that next season, Idol 15, would be the final year of the generation-defining music show. It was appropriate, then, that the finale celebrated the show itself with a bit more fire than usual. Gildshire knows there will be plenty of time to talk about the end of American Idol. Let’s focus on Nick Fradiani. Will he be prosperous? What Idol from the past does he most resemble? What about Clark Beckham, Fradiani’s vanquished runner-up? 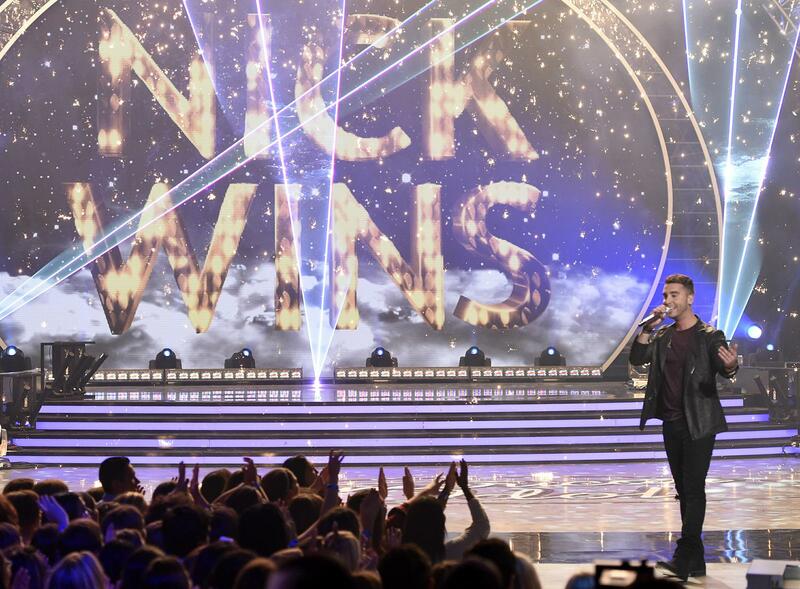 Will Nick Fradiani Be Successful? We predict a modicum of success for Mr. Fradiani. The days when the mantle of American Idol meant automatic platinum standing are long past. But Fradiani has an excellent mainstream medium-rocker voice. He also possesses an emerging stage presence, after seeming to fade into the background mid-season. We predict he will be more successful than the Idols of the past three years. He will have a very nice career, without attaining “sensation” status. He Sounds Like…? Chris Daughtry (performing now as just “Daughtry”) is the name most often mentioned, but Gildshire believes it to be an inaccurate comparison. Daughtry has an edge more raw than Fradiani’s. We find David Cook to be a better comparison. Whither Clark? Clark Beckham is in an awkward position. He is a folk-type crooner without the (albeit dwindling) muscle of American Idol to support his efforts. He will find a niche sales spot well down on the charts. Expect to enjoy him at a small club near you. One year to go and Gildshire will be here providing occasional updates as Idol XV starts to get underway.